Friday, November 9, 2012 Posted by Sarah M.
Are you sick and tired of having your outdoor firewood rack rusting whenever the temperature drops or rains? Look no further! The Woodhaven Firewood Rack is a top of the line rack that is made right here in the U.S.A. The Woodhaven is a very sturdy, heavy duty rack. The structure is made from 16 gauge steel and all of the nuts and bolts are made of stainless steel – which means that not one aspect of the rack will rust. The Woodhaven Firewood Rack has a powder coat finish that is available in a black, baked on powder coat finish. Not only is this one of the best finishes available, but it is also environmentally friendly as well. Another perk of the Woodhaven Firewood Rack is its easy assembly. 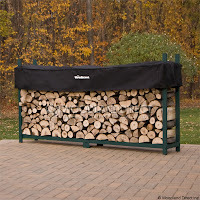 There are a number of different sizes available in the Woodhaven Firewood Rack and two different color covers: black and brown. The covers are made from a top quality, coated canvas that has velcro located on the front and side of the rack for quick access to your firewood. The standard cover that arrives with the rack covers the top 12 inches of the wood – which keeps the top of the wood dry and ready to burn, and allows for cross ventilation. However, there is a full cover available at an additional cost. This is often recommended for people that live in areas with extreme weather. It is also important that you properly “cure” your firewood by using a wood rack. Drying it out will help prevent any mildew growth and decrease harmful creosote buildup in your chimney. Overtime, creosote buildup can ignite and cause a major fire. The Woodhaven Firewood Rack is built to provide a lifetime of service, and comes with a lifetime warranty. When you purchase a Woodhaven Firewood Rack, you are buying the last firewood rack you will ever need!